The city today unveiled a second egg-shaped digester at the Sand Island Wastewater Treatment Plant. The new digester serves the sewer needs of residents from Kuliouou to Red Hill and will allow the city to approve new housing units in Honolulu's dense urban core and avoid development in the country. It will also allow crews to make repairs as needed to the existing digester without any disruption to services. Honolulu Mayor Kirk Caldwell said "if we're going to have the capacity for more people living in our city, we need a sister digester that provides that capacity, and also a redundancy, so if one of our digesters goes down, we have another one that continually processes our sludge." It cost $30 million to build this second digester. 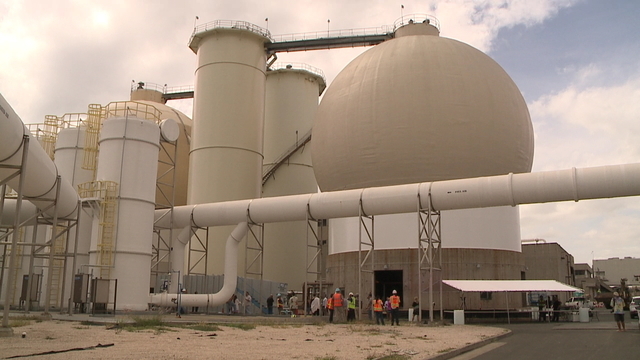 Along with a recently opened third boiler and sludge intake facility at H-POWER, the second digester at Sand Island brings Honolulu closer to Mayor Caldwell's goal of eliminating the need for a daily landfill on Oahu.